We’ve always loved national parks. And that includes monuments, forests, and recreation areas. Our hiatus has taken us across much of the Northern Hemisphere. We’ve spent quality time in 30+ national parks in seven countries, and on two continents. In fact, the National Parks system is one of our most impactul levers. 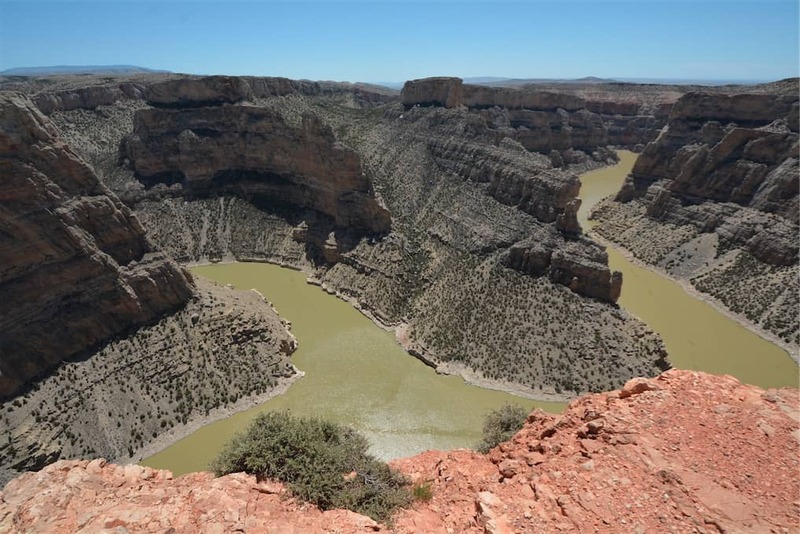 Bighorn Canyon National Recreation Area was never on our bucket list. We’d heard of it in passing, but didn’t know a thing about it. We knew only that it sat between Yellowstone National Park (which we were leaving) and Devil’s Tower National Monument (where we were headed). We’ve always loved National Parks. 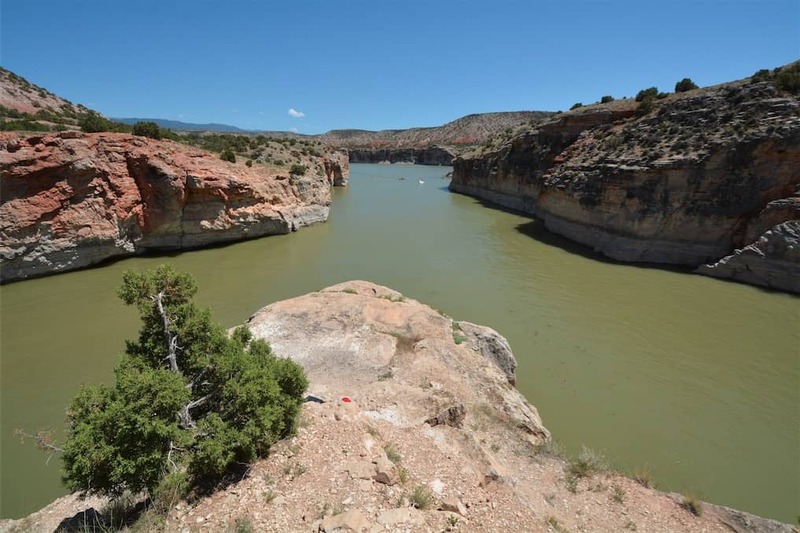 And Bighorn Canyon would be no exception. It took about two hours for us to drive from Sheridan, Wyoming, where we were couchsurfing, to the south entrance to Bighorn Canyon, just north of Lovell, Wyoming. The visitor center was in Lovell, which made it easy for us to bone up on the layout of the park, and to determine which sites we wanted to visit. When visiting national parks, we always stop at the visitor center, first. And you should, too. At the visitor center, we watched an old school video (pretty sure they were rocking the VHS) that blew our faces off. 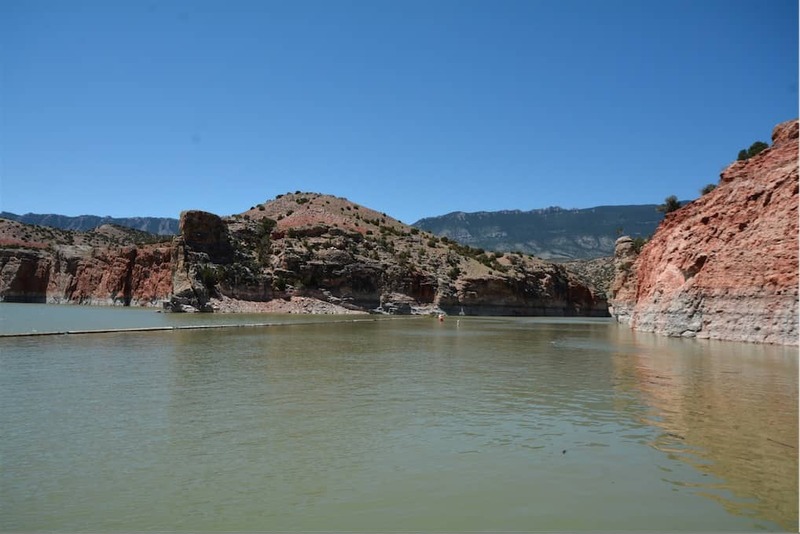 It decoded the billion-year-old rock formations found in the canyon. Products of the endless cycles of uplift and erosion, which continue even today. From the visitor’s center, we headed north on highway 37, into Bighorn Canyon. Our first stop was Devil Canyon Overlook. 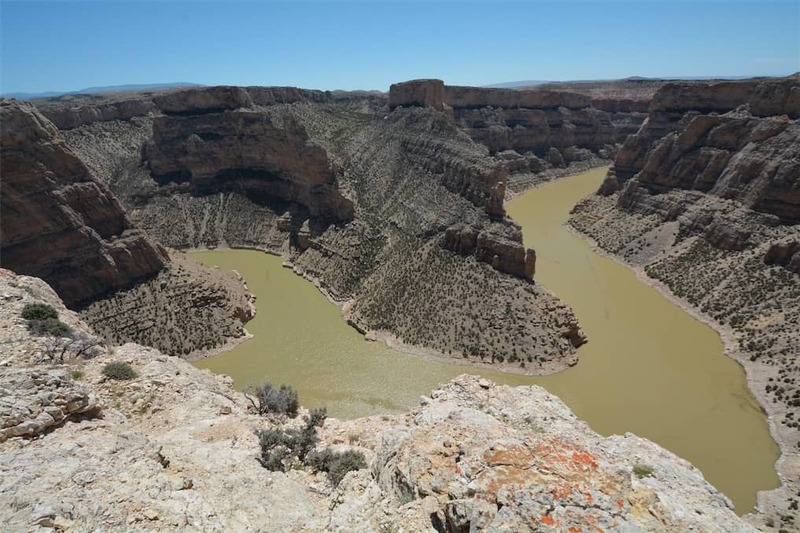 The overlook provided panoramic views of Bighorn Canyon and the Bighorn River winding through it, hundreds of feet below. The view reminded us a lot of Horseshoe Bend near Page, Arizona. We continued north along Hwy 37 to Barry’s Landing. There a campground here, and a large boat ramp and dock. We parked at the top and walked down the ramp to see what was happening. A small makeshift beach was at the base of the ramp. We hung out for a while with another family who were clearly making a day of it. They had a small son, younger than ours, and and pretty awesome dog. The were even public restrooms, which were pretty clean, right at the end of the floating dock. Conscientious, Wyoming! Very conscientious! We drove back south for a different viewpoint of Barry’s Landing. This time, much higher off of the water. In fact, we arrived just in time to see a few brave souls jumping from the surrounding cliffs. (You can see some of their clothes on the rocks in the picture below Red and black. A third of the way up from the bottom center of the photo). It was not a small jump (some 30+ feet), and not for the faint of heart. We felt queasy just watching them. Again south on 37, we saw wild (wild) horses in the valley below. Not close enough to photograph, but we were able to catch glimpses of them through our field glasses. They sure didn’t hang around long. 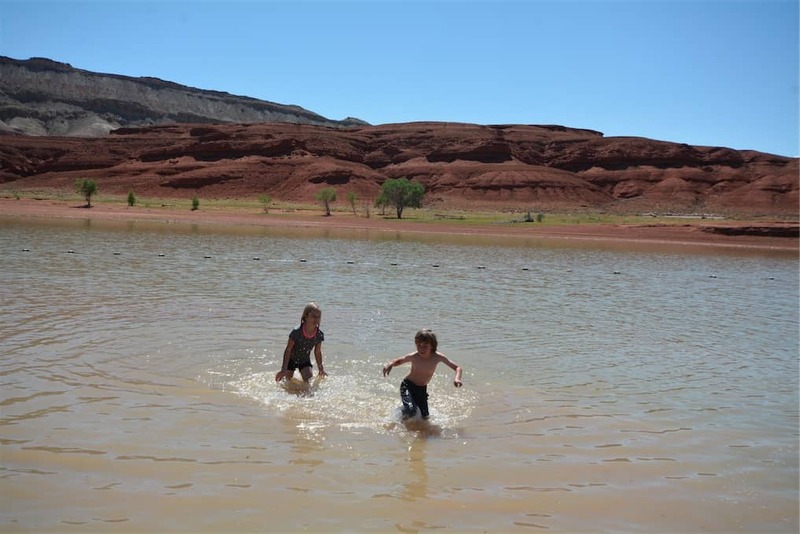 Our time in Bighorn Canyon came to a close at Horseshoe Bend swim beach. The day was mighty hot, so this gave the kids an chance to cool off. 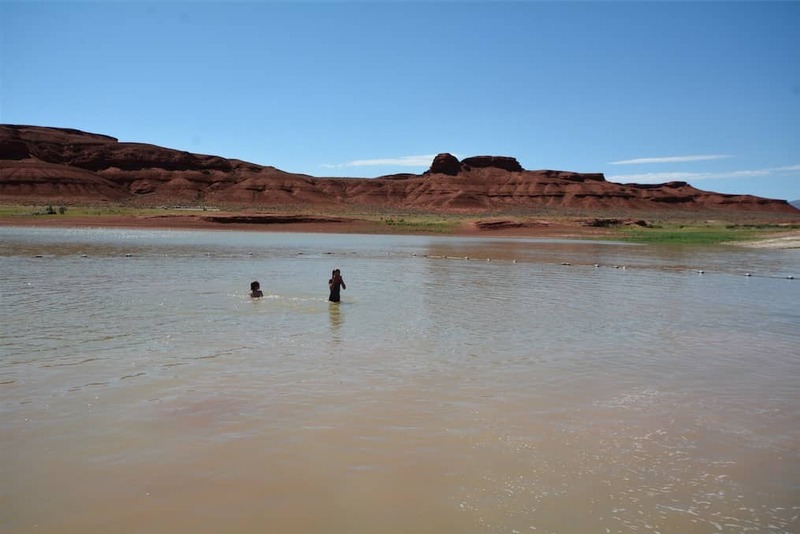 The water had a reddish-brown hue from the surrounding red clay cliffs. The scenery was otherworldly, and we enjoyed our time there, thoroughly. A great way to end our day. If you’re in the area, Bighorn Canyon is a must-see. Recreational opportunities abound. And the geologic story flabbergasts the mind. If you’re heading to, or from, Yellowstone’s east side, you can access Bighorn Canyon from Sheridan, Wyoming or Billings, Montana. Do so, and you won’t be disappointed.